recently there was a big question about dose, but the review below addresses that. However getting the dose and type right is tricky. Here are the details behind the recommendations. My fish stories page has some specific products (to which I have no $$ connections). In 2011, a research team at the New York State Psychiatric Institute did some great math.Sublette Their study is detailed below. It’s the reason for the following strong recommendations, including: “do the math”. The problem is, it’s really difficult to do the math you need to do in the grocery store when you’re choosing a fish oil. Most patients have trouble doing this even sitting in my office. Conclusion: sure enough, it’s worth trying to do the math in the grocery store. Look on the back, find the EPA-per-pill number. If they don’t provide one, move on. If they do, look at the top of the label: “serving size” is often more than one pill. If so, divide all the numbers they show by the serving size. For example, if serving size is two pills, divide all the numbers shown by two. How many pills will it take to reach 1,000 mg of EPA? divide 1,000 by the amount of EPA per pill (watch out for the serving size trick here). That’s how many pills it’s gonna take per day: between 2 and 7 pills. The more concentrated versions are more expensive. If you can actually price these “per milligram of EPA” while you’re standing there, you’re amazing. But you’re not done. What percentage EPA is each pill? add EPA plus DHA, that’s the total omega-3 in each pill. Write that down. Now divide: EPA divided by the total you just obtained. This should be 0.60 or greater. If not, try another brand. The next section explains the study that is the reason why you’re doing all this. My fish stories page has some specific products (to which I have no $$ connections) that appear to be among the lowest price ways to reach the right dose and type. The research teamSublette divided all the fish oil research studies into 2 groups. In the first group, EPA was less than 60% of the total EPA plus DHA in each pill. In the second group, the dose of EPA was 60% or more of that total. They found that fish oil was not better than a placebo in any of the studies in the first group (in fact, in some studies, it was worse than a placebo). 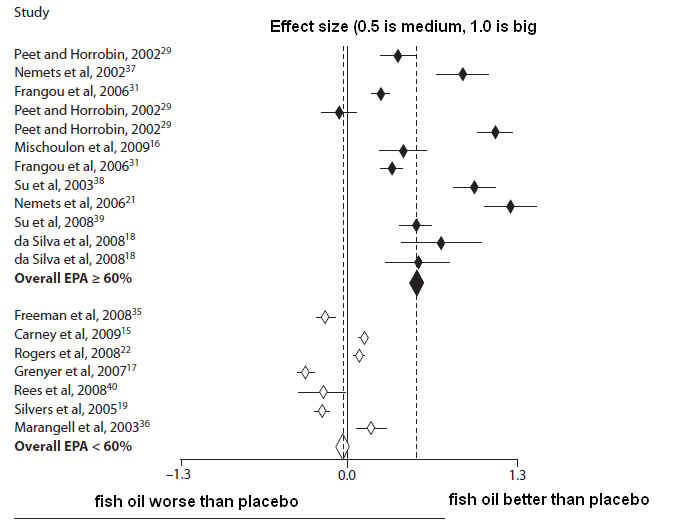 By contrast, fish oil was better than a placebo in all of the studies in the second group except one. In this kind of graph, effect size means “how much better was the treatment than a placebo?” You can see that the black group is much farther right, on average, than the white group. Far enough to make a difference in real people’s lives? According to these data, yes. In general, a small “effect size” is 0.2 or so. A medium effect size is 0.5. Getting up to 1.0 means the difference between the treatment and a placebo treatment is quite large. So, see the black diamond, the average: the effect size there is 0.53. Another similar analysis reached a similar conclusionMartins, with an effect size of 0.46. But in the latter study, the biggest and best designed research trials were actually less likely to find such a difference between fish oil and placebo, so the story is not over yet.